Tag line: "Why did women talk about Dorian Gray in whispers?" The above quote appears at both the beginning and the end of The Picture of Dorian Gray. Written and directed by Albert Lewin, this 1945 film was based on a novel by noted playwright Oscar Wilde, and focuses on the duality of man’s nature - the good and evil that is inside each and every one of us. Only in the case of this movie’s lead character, he has somehow managed to quarantine his darker side, and does not suffer the guilt of his terrible actions. Yet a reminder of his crimes and indiscretions haunts him daily, and as a result, what at first seemed like a blessing to him quickly became it a curse. The story opens in London, 1886. Dorian Gray (Hurd Hatfield), a 22-year-old aristocrat, is posing for a portrait of himself, which his good friend, artist Basil Hallward (Lowell Gilmore), is painting. On the day that the picture is to be finished, the pair is visited by the always-sarcastic Lord Henry Wotten (George Sanders), who, noting the beauty of the portrait, complimented Gray on his appearance, telling him that he should enjoy life while he is young. Suddenly struck with the notion that his youthful exuberance will eventually fade, Dorian Gray wishes to never grow old, saying he would be willing to sacrifice anything - even his soul - if he could remain young forever. It isn’t until later on that Dorian realizes his wish has been granted; despite the passage of several years, his body has not aged. Instead, the picture of himself that Basil painted grows older in his place. But more than showing his true age, this portrait also serves as a reflection of Dorian’s soul, becoming uglier with each of his misdeeds. As Dorian lives the life of a scoundrel, breaking the heart of singer Sibyl Vane (Angela Lansbury) before agreeing to marry Basil’s niece Gladys (Dona Reed), his painted image continues to morph and deform, growing more grotesque as the years drag on. Try as he might, Dorian cannot ignore the ghastliness of his portrait, and wonders if there’s still time to repent his evil ways. Hurd Hatfield is perfectly convincing as the title character, transforming from a naïve young gentleman at the outset into a hardened shell of a man who cares only about his own pleasures. Yet despite his continued debauchery, Dorian is always aware of what he’s become, and occasionally expresses a desire (however briefly) to change his ways. 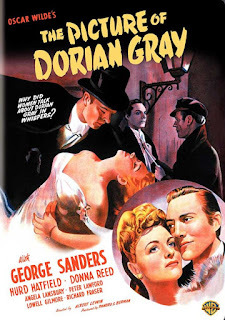 As good as Hatfield is, though, the best performance in The Picture of Dorian Gray is delivered by George Sanders, whose Lord Wotten is directly responsible for Dorian’s shameful shenanigans. It’s he who convinces Dorian that youth is to be treasured, and life lived to its fullest, without regret or remorse (“I like persons better than principles”, Wotten says at one point, “and persons with no principles better than anything at all”). Dorian Gray may be the monster of this story, but Lord Wotten created him, and Sanders is so deliciously hedonistic in the role that, as bad an influence as he is, you can’t help but admire his character’s impudence. 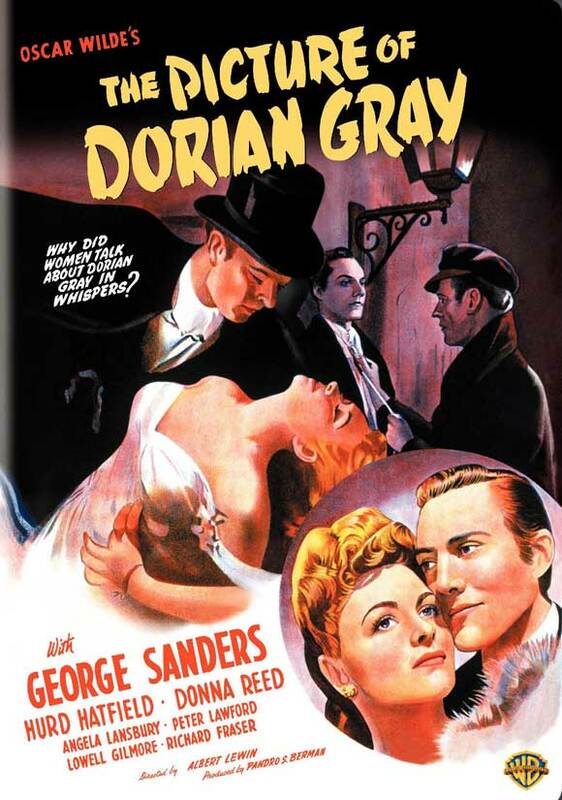 In addition to its talented cast, The Picture of Dorian Gray features several chilling scenes, all of which center on the portrait of its lead character. Soon after putting Sibyl Vane’s virtue to the test (a move instigated, of course, by Lord Wotten), Dorian decides to break off their romance, and sends her a damning letter, calling her character into question and saying they will never see each other again. Shortly after this letter has been delivered, Dorian notices a slight change in the picture’s facial expression, a sneer on the lips that gives it a harder edge. As Dorian’s actions become more sinister, his likeness alters until, at last, it is beyond hideous. Though shot in black and white, director Lewin does, on several occasions, show us Dorian’s portrait in full-blown color, making its monstrosities all the more unsettling. A morality tale about the effect that evil has on our psyche, The Picture of Dorian Gray is one of the more disturbing films to emerge from 1940’s Hollywood, and is a truly thought-provoking motion picture.